The Oceanic Accel Fin, One Fin, Any Ocean! The Accel Fin Design chooses Power over Frills. This Compact and Responsive Fin has Clean Lines and Efficient Shape that makes it an Excellent All-Around Fin. The Accel Fins pronounced Side Rails and Center Channel Direct Thrust behind the diver for Maximum Propulsion. 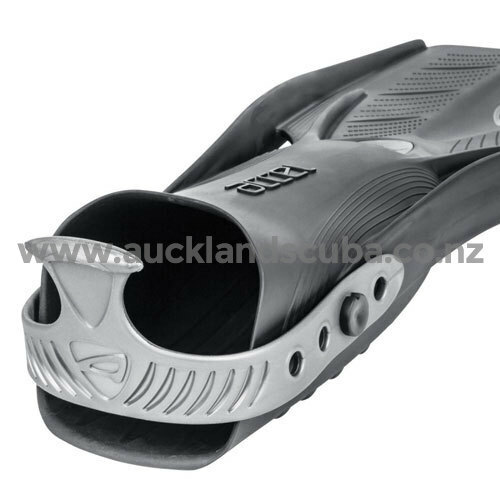 The Fins Vents at the Base of the Blade Improve Water Flow down the Length of the Blade for Greater Efficiency. With its Excellent Water Flow Characteristics, the Accel allows divers to swim efficiently with Multiple Kicking Style's, from scissor to frog to sculling. The Accel's unique, High-Stretch Strap Design dramatically Reduces the Bulk and Drag of typical Open Heel Fins, all while being effortless to slip on and off. The Accel's Foot Pocket Posts also Accept Standard Quick-Release Buckle Fin Strap Assemblies. 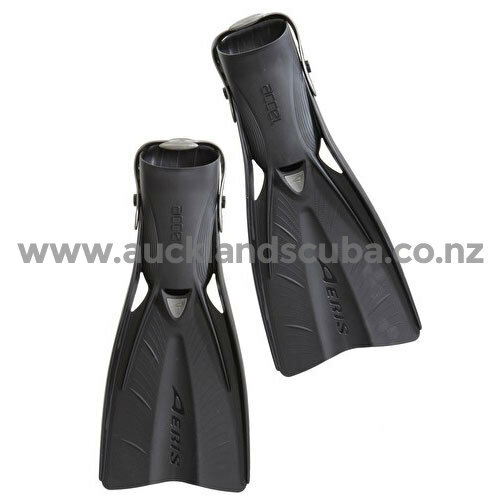 The Fins Streamlined Foot Pocket design accommodates a wide range of boot styles. Underneath, the Textured Sole provides Traction on Boat Decks and other Slick Surfaces. The Highly Durable Monoprene Synthetic Rubber Blade material ensures the Accel will last long after it becomes the divers' favorite fin. Oceanic Accel Fin, One Fin, Any Ocean!